IIASA sees its people as its most valuable asset and continues to attract and retain world-class talent. Researchers from member countries working at the institute gain access to all aspects of the IIASA network and can contribute to building the systems analysis capacity of their home countries. 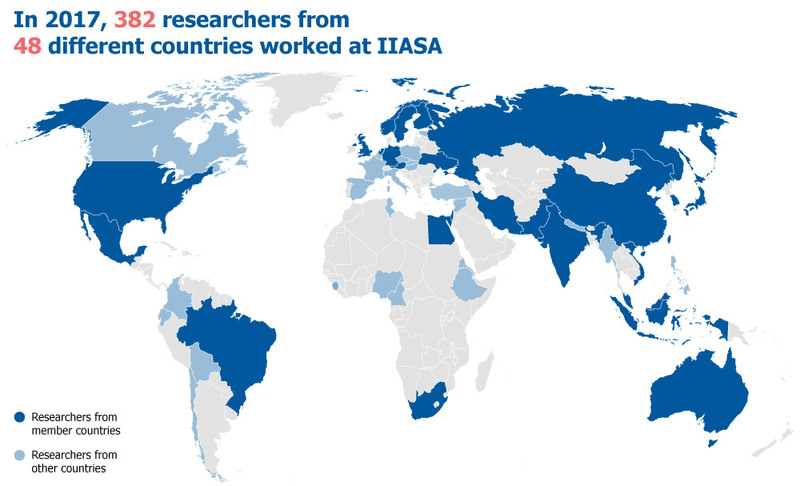 More than 300 international researchers from around 50 countries currently work for IIASA, while another 3,500 researchers, science-to-policy workers, and diplomats from about 65 countries are actively involved in the institute’s activities. 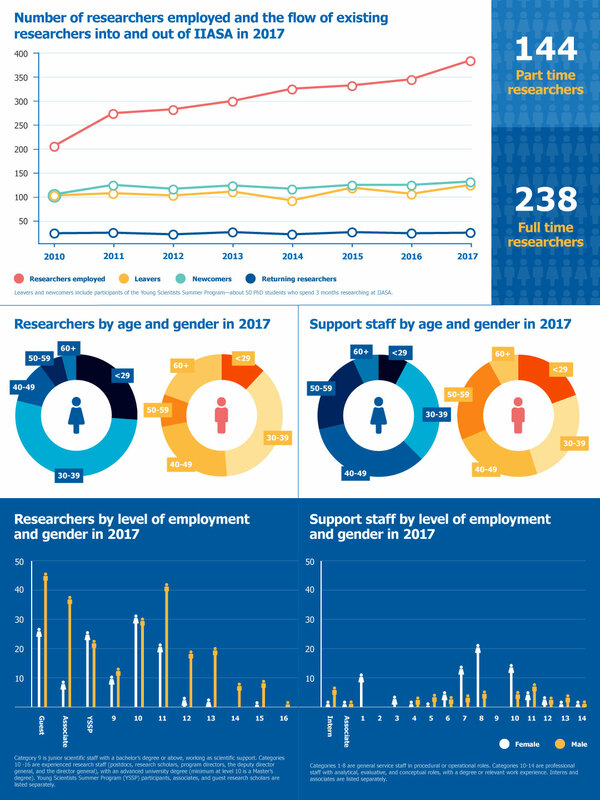 Following a period of rapid expansion in the number of researchers and staff working at the institute, IIASA has placed a high priority on human capital management for the next five years. In 2017, a new staff performance evaluation system was introduced, and a new diversity policy is currently being developed. In addition to Austrian labor law, a series of federal laws concerning IIASA and international organizations in Austria provide the institute and its employees with a range of immunities and privileges. This allows IIASA to offer competitively advantageous employment conditions compared to Austrian employers (Austrian federal law and official gazettes: BGBl. Nr. 117/1973; BGBl. Nr. 677/1977; BGBl. Nr. 344/1978; BGBl. Nr. 476/1978; BGBl. Nr. 441/1979; BGBl. Nr. 219/1981; BGBl. Nr. 609/1990; BGBl. Nr. 666/1994). Human resource policies and procedures are in place for staff categories, personnel procedures, overtime, leave, maternity regulations, childcare benefits, retirement, temporary assignment, incentive payments, good scientific practice, conflicts of interest and commitment, code of conduct, outside interests, housing services, and health and safety rules. These policies are contained in the IIASA handbook and staff rules and regulations (sections 4.2 and 4.3 of the IIASA Operating Procedures and Policies). The appointment of new staff and extension of existing staff contracts is managed and documented through the forms and approval processes of the IIASA management information system. Planned absence from IIASA during the YSSP, including vacations and business travel limited to about three weeks. In 2017, the CDAT team also proposed guidelines for postdoctoral engagements at IIASA, including information regarding hosting and mentorship, the core research agenda, non-IIASA activities, program-specific activities, and regular reviews and advice. These guidelines are in the final stages before implementation and will become part of the postdoctoral information provided to prospective postdoc candidates. Many of the characteristics that make IIASA unique also present challenges for both the attractiveness of the institute as a place to work and for the retention of high-quality employees. The international nature of IIASA, while being a distinct advantage, also raises challenges in terms of managing cultural, social, and geographic diversity. The institute was founded with a commitment to the principles of equal opportunity, anti-discrimination, gender balance, cultural accommodation, and geographical distribution in its hiring, promotion, and administrative practices. With a staff comprising over 50 nationalities, it is an inherently diverse institution. In the past years, IIASA initiated a multi-faceted examination of diversity in all its aspects. The process included taskforces that collected and analyzed employment data at IIASA, conducted surveys and interviews, delved into diversity literature, and prepared reports, as well as diversity-focused discussions at meetings and retreats. The purpose of this exercise was the definition and institution of a set of policies and administrative practices that both set and achieve targets for increased diversity throughout the workforce, and foster a workplace environment that accommodates diversity in all its forms. A Diversity Taskforce produced a draft Diversity Policy, which included both statements of principles and aims, and called for the development of diversity goals, timelines, and strategies. In 2017, the Council issued Resolution 696 in support of ongoing and planned actions. This includes the formation of a holistic diversity strategy that will be developed by IIASA with the assistance of an external consultant. The initial terms of reference would be an assessment of diversity, an analysis and benchmark of diversity compared with other organizations, and the development of a vision for a more diverse workforce. The Human Resources department will report back to Council on the ongoing progress and planned actions by November 2018. To underline the importance of offering equal opportunities, IIASA explicitly states its commitment to a working environment that promotes equality, diversity, tolerance, and inclusion within its workforce in all job advertisements, and encourages qualified candidates of both genders and from all religious, ethnic, and social backgrounds to apply. In 2017, IIASA staff continued to benefit from the services of the Institute Counselor, a Human Resource Consultant and Cognitive Behavior Therapist, for confidential support with the challenges and opportunities related to living and working in an international scientific environment. In her capacity as work psychologist, she also provides coaching and counseling related to cultural and social diversity and work environment issues. The Institute Counselor provides twice-yearly anonymized updates and statistics to management to address any issues that may arise. 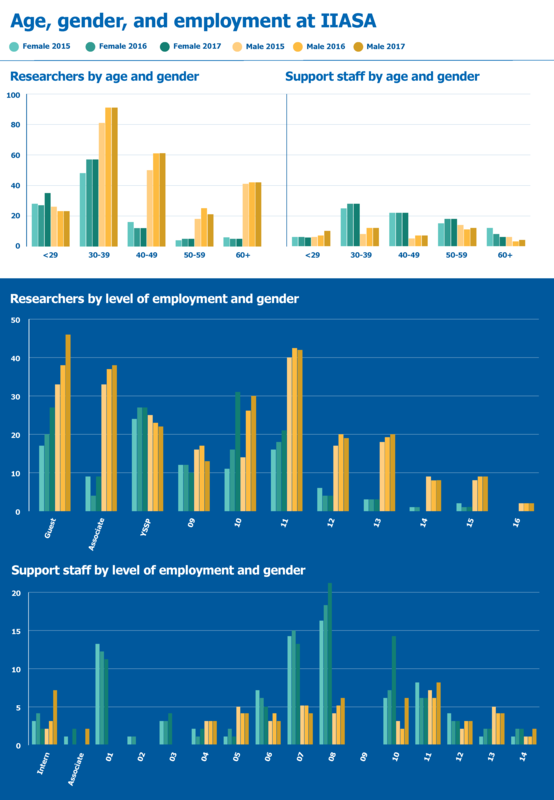 Detailed figures regarding gender balance by age and by level of employment for scientific and administrative staff are shown in the infographic. The IIASA guidelines and regulations for good scientific practice were updated in 2016. They are intended to contribute to the prevention of scientific misconduct, conflicts of interest and commitment, while promoting quality science. The institute recognizes its responsibility to nurture an environment of mutual respect, tolerance, and ethical behavior according to the general principles outlined in these rules. No cases of scientific misconduct arose in 2017. All IIASA staff must be treated equally and with respect, regardless of gender, race, religion or belief, nationality, ethnic or social origin, age, sexual orientation, marital status, or other aspects of personal status. No behavior that constitutes harassment, sexual harassment, discrimination, bullying, retaliation, or any related acts is tolerated. The IIASA Code of Conduct Policy for a Professional Working Environment was updated in 2016. This policy specifically extends personnel procedures to include unprofessional behaviors in the workplace, namely: harassment, sexual harassment, discrimination, bullying, and retaliation. The responsibilities of the institute, staff, and management are clearly outlined in the Code of Conduct. IIASA staff found to be in breach of these conditions are subject to disciplinary action in accordance with Article IX, Disciplinary Measures of the IIASA Staff Rules and Regulations. This may include an oral or written reprimand, or summary dismissal in accordance with the applicable Austrian laws. The failure by management to address a violation of the Code of Conduct that has come to their attention may result in appropriate legal or disciplinary measures being taken against them. No official complaints of misconduct were reported to the IIASA Human Resource Department in 2017. The policy was distributed along with the guidelines setting out tasks and explaining the process, as well as new appraisal forms.